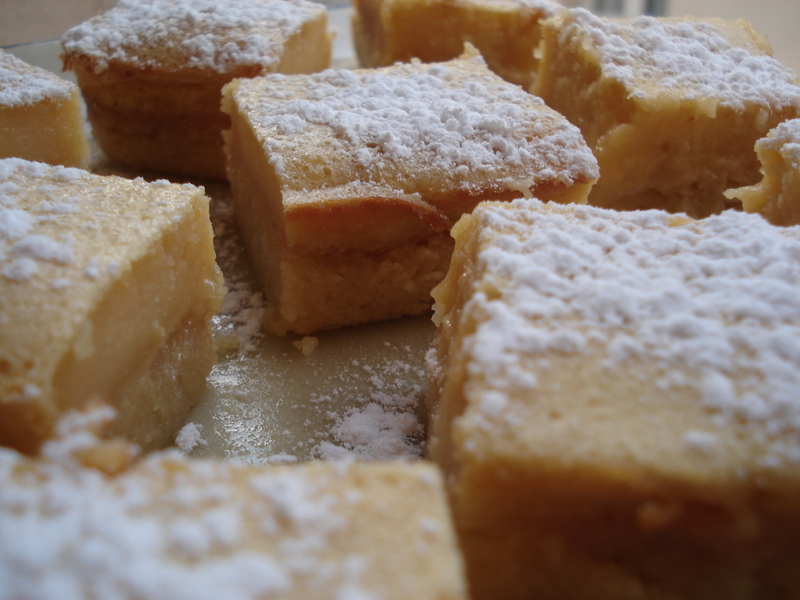 Lemon bars are one of my very favorite desserts – they always have been. When I was a teenager, my mom, sister, brother, and I would trek down to Albuquerque for violin lessons – that’s an hour from Santa Fe (where we lived) and thus shows pure dedication. Now that I’m thinking about it, though, I wonder if the dedication was really for the violin lessons… or for the lemon bars. More often than not, we would stop to have lunch at Savory Fair Café and Bakery (which I’m delighted to discover still exists 15 years later). I would always order the exact same thing – a combination plate with a colorful vegetable terrine, goat cheese and cornichons (just like in France)… and a lemon bar for dessert. 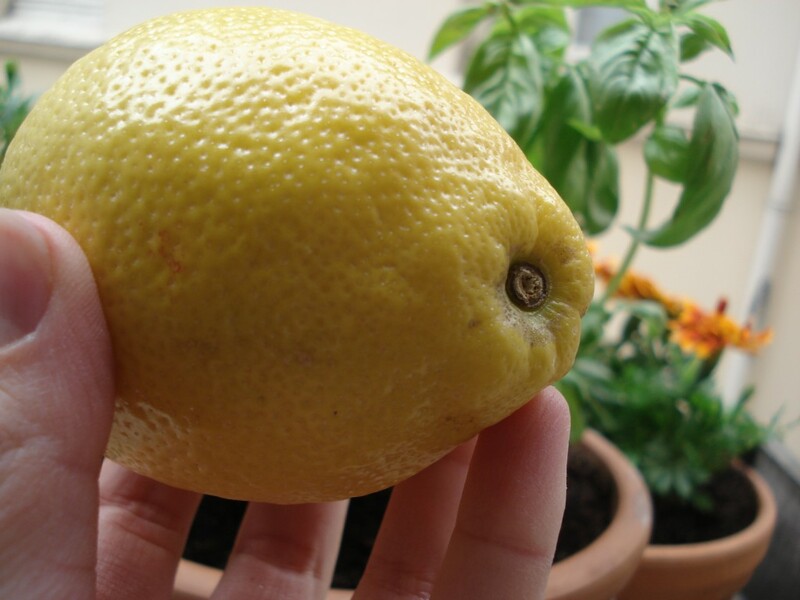 I remember it being absolute heaven – moist, tangy and buttery. The next time I tasted lemon bars as good as these, was six years ago in California. I was playing bride’s maid in a friend’s wedding, and was thus a lucky witness to all that goes on behind the scenes in the days before such a big event. There were many things to be done – pick up the dress and hide it away, cut out place cards, catch up on old memories, stack cumbersome boxes as UPS dropped them off, find thread to stitch girls into their dresses… you get the idea. In order to keep us going, we ladies required regular nibbles – including the Maid of Honor’s lemon bars (homemade from freshly picked Meyer lemons). I kept the recipe and made it many times – with success! They always turned out because I followed the directions. Problems arose, however, when I got a scale and began weighing ingredients (like butter) in grams. Despite careful calculations, my lemon bars were no longer turning out the way I wanted – something had gotten lost in translation. Finally, this weekend, I succeeded in making my best lemon bars yet. The main secret was going for more butter than less and doubling the top layer (filling) on the original recipe. I also used a rectangular cake pan (like for making a loaf), so ended up with a much thicker crust. In other words, these are very “gourmand” lemon bars. Instead of powdered sugar, I used “cassonade” (except for the sprinkles on top). This is a type of crystal-like brown sugar that is easily found in French groceries stores. It’s a staple in our house. Most important: DO NOT OVERCOOK THE TOP LAYER!!! 1. For the crust, beat all the ingredients together and bake for about 20 minutes (180C/350F). You’ll put this back in the oven, so don’t worry about it being undercooked. 3. …the filling. Mix all the ingredients and pour over the crust. 4. Bake for about 20 minutes. Don’t overcook or it will become chewy and lose the moisture. The filling should just barely be solid when you take it out. If you touch it, you fingertip should leave a mark. 5. Let cool and cut into squares. Sprinkle with powdered sugar if desired. This entry was posted in Recipes (All) and tagged dessert, santa fe. Bookmark the permalink. I LOVE lemon bars! Will definitely have to try your recipe out! Might be even better with lemons from the Southern Hemisphere! Keep me posted!